What Adams discovered is what many have found in the rehabilitated Motor City – a well established urban farming movement with support from local businesses and city officials that was growing jobs and revitalizing communities. Adams wanted more opportunities like that for the neighborhood of Brightmoor. 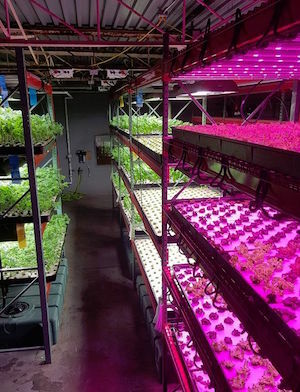 After researching the state of urban agriculture in the city and determining that seasonal jobs wouldn’t cut the mustard, Adams bought a warehouse in August of 2014, unoccupied since 1998, on a local industrial complex and set up the shell of a indoor vertical hydroponics farm. “We set up this business as a social enterprise, a limited liability corporation with the social cause of employing people who are difficult to employ, bringing blighted structures back to life and making a vibrant opportunity for our neighborhood,” says Adams. By March of 2014, the warehouse was renovated enough to set up shop. The farm sits inside a 7,000 square feet warehouse. Using artificial light and seven 20 foot high vertical towers and racked trays, Adams’ workers produce around 75 pounds of lettuce and kale a week, and approximately 40 pounds of basil per week. Adams has recently received funding to install an additional 35 vertical growing systems in the rest of the space, which will serve to increase output as well as his customer base. Adams sells to local businesses, mostly restaurants and grocery stores. With some proactive self promotion and good old fashioned cold calling, he managed to get Artesian Farms produce into a regional chain with 15 stores as well as one local branch of Whole Foods. One growing contract took an hour while another took 18 months to negotiate. For Adams it’s about having the right product and understanding how to sell your company’s narrative. Adams introduced his product to the local community on Earth Day last year, gathering locals to celebrate and experience their growing unit’s food. The positive feedback provided the farm with early momentum. Artesian Farms also markets through the local farmers’ markets. Artesian Farms is very aware of the potential issues facing urban employees such as lack of transportation, child care, and background checks that prevent many people from making a fresh start or finding gainful employment. Adams offers his employees a salaried wage and accommodates their scheduling needs as much as possible.